The South Carolina white-tailed deer Antler Records Program was initiated in the spring of 1974, and since that time, 6,783 sets of antlers (6,517 typical and 266 non-typical) have been officially entered into the list, according to Charles Ruth, Deer and Wild Turkey Program coordinator for the S.C. Department of Natural Resources (DNR). Initially, scoring sessions were only conducted a few times each spring, but since 1987, antler scoring sessions have been scheduled throughout the state with about 12 sessions occurring annually. Each year DNR wildlife biologists and wildlife technicians score about 500 sets of antlers. Generally, only about 25 percent of the antlers that are scored make the Antler Records List with the bulk of entrants falling short of the minimum scores, said Ruth. 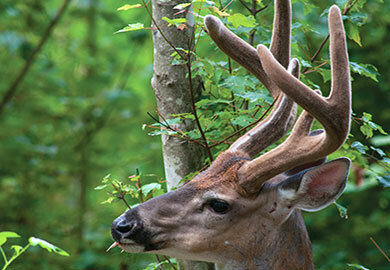 The first "Records of South Carolina White-tailed Deer" was published in 1998. Since that time 13 updates have been published on an annual or semi-annual basis. The updates include only the new entries for the current year and the top 100 typical and top 50 nontypical entries from the All-time List. The new online publication represents the complete listing of all typical and nontypical entries on file through spring 2016. It is only available on DNR's website because the size of the document makes printed copies cost prohibitive. The purpose of the Antler Records Program is two-fold, said Ruth. First, because of the increased interest in deer hunting exhibited by sportsmen, it is a means of recognizing outstanding white-tailed deer taken in South Carolina. Secondly, it provides management information that allows DNR wildlife biologists to identify areas that produce quality deer. When particular areas stand out it is important to attempt to recognize the underlying characteristics that produce outstanding animals. "Records are based on the Boone and Crockett Club scoring system," Ruth said, "which measures the mass and symmetry of deer antlers in two categories: typical and non-typical. The scoring system is based primarily on antler size and symmetry and includes measurements of the main beams, greatest inside spread of the beams, circumference measurements at certain designated locations, and the number and length of the points. To be counted as a point, a projection must be at least one inch long and it must be longer than it is wide at its base." Deductions are made for points that arise abnormally from the main beams or from other points and for symmetrical differences between corresponding measurements on the right and left antlers. For non-typical antlers, abnormal points are added to the score rather than being deducted as in the typical category. A set of antlers is classified as typical or non-typical based on its general conformation, the number of abnormal points, and a determination as to whether it will rank higher in the typical or non-typical category. Current minimum scores for the South Carolina Antler Records List are 125 typical points and 145 non-typical points. All antlers must undergo a minimum 60-day drying period before they can be officially measured and a fair-chase statement must be signed for all hunter killed deer. If a set of antlers meets the minimum score the record is added to the list and a certificate is issued recognizing the outstanding white-tailed deer taken in South Carolina.